I think it is a positive evolution: more and more women are starting their own Drone / Ambient / Experimental / Noise project. This can be solo - think ProtoU, Lamia Culta, Inwolves, Artefactum, Allseits, Lamia Vox, Halgrath and so on - or in a partnership (Martyria, Corona Barathri, Hymnambulae, Der Blaue Reiter a.o.). To this growing list we can now add the name of Martina Betti, hailing from Italy. 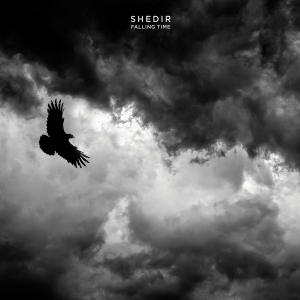 Under the moniker of Shedir, she composed a first master piece, which is called Falling Time. It got released by one of the most influential labels within the genre, Cyclic Law, in an edition of 300 four-panel digipack CD’s, or via the digital sources (cf. the label’s Bandcamp-page). The eight compositions last for just over forty minutes, and everything was mastered eventually by the famous sound-artist Lawrence English at Negative Space (Australia). The Falling Time album is ‘an aural ticket to a non-place’  ‘building on constant cinematic tension, frictions and collisions of sounds, through which the mind is transformed, freed from daily dualities, at one with its psychic abilities’. There you have it… No, actually this is quite a decent description, for Falling Time indeed is a full-cinematic experience, brain-twisting and stimulating the listener’s phantasy and imagination. The compositions are, and this goes for the better part, like a symbiosis of hypnotic ambient drones, organic sound sources and field recordings, and multiple digital synth layers. It’s a story-telling experience, transcendental, absorbent and un-physical in essence, unlimited in restrictions and trespassing the borders of the consciousness. in an emotional way, you sort of get towed towards beautiful yet still haunting dreamscapes, at the same time being meditative as well as disturbing. Besides, a couple of fragments go further, deeper, when Shedir trespasses its own borders sound-wise. Sometimes ecstatic and extravert, then again introspective and intimate in shape, the variety on feelings and experiences shows potential. Vast landscapes of endless possibilities against the restrictions of the Inner Self, dynamic walls of enlightenment versus invisible and secret spheres of desolation and desperation, Falling Time constantly surprises, seduces, mesmerizes and does it all over again. Shedir even comes up with a couple of electronic moments - trancelike beats and energetic pulses opening the portal to a next level of mental / spiritual existence. Levitation against down-earthed heaviness, once again a naturally explored process courtesy of this experience.